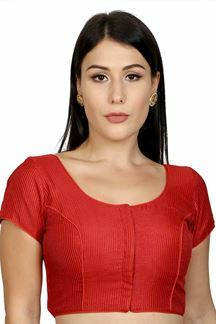 Wear a ravishing grace dressed in this exclusive red designer self shimmering blouse featuring a plain self glowing expanse for a chic appeal. Dress with contrasting yellow lehenga and sky blue dupatta for an enriching show! Note: Color may slightly vary due to digital photography.